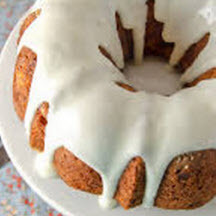 A delicious Bundt® cake version of the Hummingbird cake, a flavorful, moist cake with crushed pineapple, banana and chopped pecans, frosted with a cream cheese frosting. Preheat oven to 350°F (175°C). Grease and flour a 12-cup Bundt® pan. For Cake: Measure flour, sugar, soda, salt, cinnamon, oil, eggs, vanilla into mixing bowl. Beat until smooth. Stir in pineapple with juice, bananas, and pecans. Pour into prepared pan. Bake for about 70 minutes. Turn cake out onto rack after cooling for 20 minutes. Cool completely and frost with cream cheese frosting. For Cream Cheese Frosting: Beat butter and cream cheese at medium speed with an electric mixer until blended. Gradually add powdered sugar, beating until light and fluffy. Stir in vanilla.